Fishing Report Out On Spruce Creek! This afternoon in the backwaters of Port Orange in the Spruce Creek waterway we had hot action on super spooks and super spook juniors. The species being caught were jack, ladyfish, and snook. We are also starting to see tarpon rolling in the backwaters. The most popular swimbaits to use in the backwaters around the area we fish are D.O.A CAL shad tail's in the tequila sunrise and watermelon/clear holographic, I pair those lures with a 1/4 red jig head by D.O.A. Our favorite and most productive lure we use are the super spook and spook Jr. We always have one tied on no matter what. I have had times where my spook gets nailed mid day by monster jacks. Some people like to use a very fast retrieve when it comes to the way they work the lure. We prefer walking the dog as slow as you can, in some cases it has to be painfully slow. But that subtle change in action can make all of the difference. Our favorite color for the super spook is the shiny metallic chrome and bone. 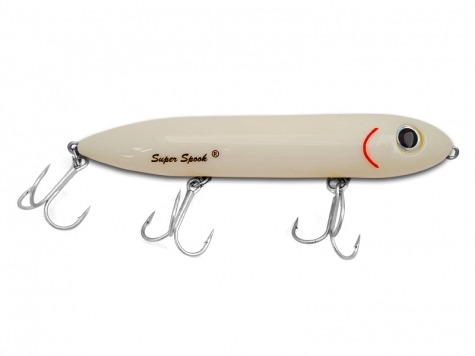 Our favorite colors for the super spook junior are red and white and a natural grey color. One important modifications we do to our spooks out of the box are we upgrade the treble hooks to 3x strong owner or gamakatsu magic eye trebles. The hooks from the factory are quite weak and typically bend out after a few fish. Not only do these upgraded hooks have better strength but they have helped with the hook up ratio due to the fact they are razor sharp.